LAND” 2nd Place: XFrog Plants Vols 1 & 2 — 2,900 plants. Planetside Software — Terragen 3 Creative with animation. WorldCreator — Indie license. bitethebites — ShaderTool. Silva3D — Mega Bundle Vol.1 (or pick four from either: Archive Grasses; Balcony; Wildflower; Garden Flowers; Boxwood; or Shrubs). 3d Art Direct — Interview “The Making Of”. 3d Art Direct — 1 Year “Back Issue Access”. Plug n’ Pixels — Interview. 3rd Place: XFrog Plants Vols 1 & 2 — 2900 plants. Planetside Software’s Terragen 3 Creative. WorldCreator — Indie license. bitethebites — ShaderTool. Silva3D – Two Choice (pick two from either Archive Grasses; Balcony; Wildflower; Garden Flowers; Boxwood or Shrubs). 3d Art Direct — Interview “The Making Of”. 3d Art Direct — 1 Year “Back Issue Access”. Plug n’ Pixels — Interview. Join our mailing list to get a free magazine speeding to your inbox. Complete access to all our magazine back issues, for just $35. Join our live webinar-based workshops for 3D digital artists. Our monthly fresh inspiration for 3D artists, available on iTunes. Credits for backgrounds, from top left: theHunter: Primal; River Strid (Unique Landscapes mod for Oblivion); Imperial City surrounds (Unique Landscapes mod for Oblivion); theHunter. Copyright ÂŠ 2014 3D Art Direct. Published in the United Kingdom. No part of this publication may be reproduced, stored in a retrieval system or transmitted in any form or by any means electronic, mechanical, photocopying, recording or otherwise without the prior written permission of the publisher. No copyright claim is made by the publisher regarding any artworks made by the artists featured in this magazine. Front Cover: In-play screenshot from Aberneth’s “Fallenleaf Everglade” Unique Landscapes mod for the Bethesda videogame Elder Scrolls: Oblivion. the Art Director at Expansive Worlds about his work on directing the game The Hunter. Arthmoor, from the massive Unique Landscapes mod project for Elder Scrolls: Oblivion. an indie game developer from the UK, about creating a unique art/ landscape game in Unity. DOWNLOAD our recorded webinars and conferences, including the complete recording of the Poser Expo 3 conference! about 50% of these will have at least 2 consoles—gaming is interactive, addictive and provides another social network. Hundreds of universities around the world offer degree courses in games programming and design; so it’s becoming an acceptable career choice throughout many societies. Five years or more ago, it took millions of dollars and large teams to bring a project onto an Xbox or Playstation. Nowadays a lone developer or smaller team can gain a worldwide audience due to the indie gaming tools and platforms available—think Unity3D and Steam. Game design is another manifestation of diverse artistic expression—a creative medium exploding with challenging, original and sometimes just plain weird ideas. 3D Art Direct interviews Peter Johansson, the Art Director on theHunter, a free-to-play videogame with 4.5 million registered players. Just how does an artist design 43 square miles of real-time 3d wilderness, and make it convincing enough for experienced real-life hunters to enjoy? 3DAD: Peter, thanks so much for an interview about the amazingly realistic landscapes in the free ’open world’ videogame theHunter. 3d hobbyists and artists are increasingly aware of videogame development, especially as the realtime engines are now coming tantalisingly close to being turned into accessible creative tools for the hobby artist. But could we start, please, by first learning little about how you moved into the videogames industry? Picture: Logger’s Point screenshot, one of the game’s first hunting landscapes. least because Avalanche owns and develops its own excellent game engine. Important also in the sense that you have a growing team actually using your own great game engine, and developing games with it that are actually fun to play. Readers may have heard the news about the forthcoming Just Cause 3, the next major Avalanche title. Avalanche also develop the best-selling Just Cause series of adventure games, which uses the same game engine as theHunter. "What we're looking at is a 360-degree world, rendered in real-time using a videogame engine, overlaid with dynamic light, sound and weather. And you can walk anywhere on the terrain, in any direction, for miles..."
Hemmeldal is a reserve modeled on northern Sweden after a late autumn snowfall. Brown Bear patrol their territories among ice floes and frozen ponds, while Moose and Reindeer prefer to browse among dense thickets. Red Foxes will sometimes be seen. â&#x20AC;&#x153;If my math is correct, our current hunting reserves combined would cover an area of a little over 43 square miles in real life.â&#x20AC;? a rugged forested mountaintop somewhere in the wilds of Scandinavia? close to a really nice nature reserve where I often hike and bike. PJ: It would be nice to think so, at least regarding Expansive Worlds. Since our main focus so far has been on nature and adventure experiences. However we’re actually very close to the rest of Avalanche Studios and so our team is co-located together with them, at the main office in the central parts of Stockholm. Which is the capital city of Sweden. So, yes, it is in Scandanavia. 3DAD: Looking back, did anything in your childhood or youth spur you in this direction? of my life is definitely the impulse to create things, from an artistic as well as an engineering point of view. I can also enjoy just playing with some of all the tools available for create work as well. square kilometres, or 636 square miles. In theory we could have only one hunting reserve without any borders, covering all that map space, rather than several smaller ones. But of course there are many practical and technical reasons why we choose to break the world up into smaller pieces. To me the reserves sometimes feel like they are even bigger than they actually are, because the player moves around by foot, and moves very slowly and cautiously most of the time. If you had an vehicle for transport then the game world would probably start to feel much smaller. That’s also one important reason for why we haven’t implemented any vehicles in theHunter. We have discussed this many times in the office, because we know that many players would like to have vehicles in the game. As for myself I think vehicles would throw off important aspects of balance in the gameplay. 3DAD: Yes, I think you’re right on that. Although I do wonder about being parachuted in from an airplane, Just Cause style! development in practice is most often exactly like you say, a jungle of constrictions, and most of them being very technical in nature. It’s funny though, because I’ve realised that I tend to get more creative the more restrictions I have to consider, up to a certain point of course. Perhaps what it means is that they help me focus better on a particular problem, when I know I can’t go too far out while dealing with it. Most often the rules you’re forced to play by create a more reasonably sized playground, so to speak. And as you mix time and money into the equation you end up realizing that you have little time to dream. I love the craft of making games, as it bring most of my particular talents together in one place. I’m not too concerned with what particular project I’m working on, as I’ve done everything from the Hollywood blockbuster style to small indie games by now. from the developer point of view? Summer rain squalls and late afternoon Autumn sunlight. This type of real-time weather and sunlight — based on the time-of-day — helps to generate a feeling of immersion in the game’s landscapes. â&#x20AC;&#x153;The community has been a great resource. Real life hunters and adventurers have been indispensable. They can provide us with answers to pretty much anything related to hunting.â&#x20AC;? blueprint is done, it goes through a revision process where we look for errors and inconsistencies. We also do additional research and synchronize everything with the game designers responsible for the animal populations. The next step is to produce all the individual assets such as trees, grass, rocks and bushes and begin to assemble everything in our advanced game engine. From this point we iterate the set of basic assets, until we think the general idea is nailed down. After that we move onto additional things, such as points of interest and details in the environment layout. We might also add more types of vegetation if we think the basic cover is not enough, or if the general scene need more variation. Through this process we also begin testing things, and make sure we get feedback on the environment as a whole as well as on individual assets. When working toward deadlines you pretty much always have to compromise at some point. We’re pretty hard on ourselves, we usually have to let some things go. Which typically also makes me quite nervous, as I’m supposed to be responsible for everything looking great all the time! But so far I think I’ve managed quite well. 3DAD: And from that level of craft comes the fun. But a craft is only fun when the crafts maker knows what the all the possible angles and ways of ’flowing through’ the work are. Otherwise you’re sort of ’fighting it’ all the way. Rougarou Bayou is one of the latest Hunting Reserves in the game. A swampy marsh inspired by areas in Louisiana. USA, and with moody weather and low mists to match. Water Hickory and Bald Cypress trees cluster around shallow water areas, making it a perfect environment for Feral Hogs and Mallard Ducks. certainly pay $15 a year to hide all interface elements — such as the on-screen hand and its various held objects, and to get really big screenshots, maybe stitched panoramas. doesn’t rule out future standalone products based on the same framework and even some of the same content. I don’t think the schools would ever promote it, even as a tracking and wildlife watching game. Games are generally seen as something that happens outside the classroom — unless it’s a kind of pure science game, or about ethical choices made within certain rather confined political parameters. PJ: Of course it also has to do with markets and the efficient way our economy works. And perhaps many people are inclined to think that entertainment and education won’t blend. I think they definitely do, because having fun is most often also a guarantee for learning — if there’s something there to learn. I believe the combination have enormous potential, especially for kids today that seem to grow even more restless. Of course this is a vast topic but I think one should consider compromising in education. Perhaps a lot of small facts is not so important, as long as you learn about and appreciate the larger context of something and know how to find and evaluate the smaller facts when you need them. So the child would find it easier and joyful to go further into a subject if it interested them or because it was useful for them. As for myself I regret that my math class did not teaching me how to actually apply it to something in reality, other than the introductory infant level of ’counting fruit at the store’. There are of course a ton of different simulators and educational games out there, but none of them utilise the stateof-the-art technology that exists for pure entertainment. Which is what most people want and expect, especially kids. I think this is also part of what makes theHunter what it is. While other hunting games may be highly realistic from a gameplay point of view, most of them don’t even come close to theHunter in terms of visual complexity, which is just as important I think for the sake of immersion and fun in the longer run. 3DAD: Yes, the others I have seen look like jokes, compared to theHunter. I only saw screenshots and video, but… I laughed. Val-de-Bois and Hemmendal (below) are two of the newer mountainous reserves in the game. The upper reaches can be especially dramatic. American wilderness photographer of the 1930s and 40s — made was learning to photograph ’landscape as weather’, and then to use that technique to help express the emotions he was feeling when he was considering some sublime and vast stretch of wild land. Although... I guess that would be difficult to engineer into a game! PJ: I know what you mean. Perhaps these things don’t play a major part in the development today, as the daytime cycle, overall lighting and weather and suchlike are all quite well defined. But I do keep it in mind whenever we add new things. How it affects immersion, and what can improve or break it and all that. I’ve learned so much from past experience with theHunter and always aim to improve quality. But when doing so one also has to ask important questions around the fact that that this game is, at least as far as we know at the moment, a service that is being developed indefinitely. Therefore: what is the actual improvement we are adding? What impact does something new have on the old, and on something that is perhaps very established in the minds of a growing number of players. That’s a tough one in actual reality! 3DAD: Peter, thanks you very much. We wish you and theHunter success in the future. PJ: Thank you! This is actually the first really serious interview that I’ve ever done, since I started working with games. For some reason it has never happened before. I’m not very active in any social media and doing promotion and video interviews scare the life out of me. This type of interview is great though, as I like to go slow and get more in detail when talking about my work. 3DAD: We’re only too happy to oblige. 1. First visit the website, sign up, set up a name and player profile. 2. Download the small initial setup .exe for the game. Run it. 7. While in the Launcher, also access Inventory and switch to Accessories. Then equip (drop) binoculars and camera into spare slots. Note you can’t swop out your equipment after you set out from camp, so get your game Inventory sorted out at the start. Binoculars will allow you to zoom in. The camera gives small pictures, but larger screenshots can be had via the third-party FRAPS screenshot tool. 3. This setup stub will install a launcher, which will then start a torrent to get the full 2Gb+ game download. This main download may take a while. Now would be a good time to cook a meal! 4. The game will then auto install, after the torrent has finished downloading. 8. Once you're in the game, press the Inventory slot number to ‘equip’ the item you want on the screen. 6. In the Launcher, first set your screen resolution and graphics quality. You can’t set resolution and graphics quality inside the game itself. You’ll need a live Internet connection, as the game occasionally pings your statistics and achievements to the official website, and checks that you are not cheating. You’ll also need a gaming graphics card or equivalent on-board graphics power in your PC. Available now, as part of your 3D Art Direct Membership! SUBSCRIPTION AND BACK ISSUE ACCESS Get the NEXT 12 issues | Full access to every Premium Online Magazine published Over 100 in-depth interviews | Browse 1,200 pages with vibrant galleries Download the PDF files | Bonus content! Council, along with Vorians? And you also moderate several official Unique Landscapes (UL) threads on online forums? Arthmoor: Thanks for having me, and giving me this opportunity. Vorians is in more of a lead role these days. I am a co-lead for the UL Council, but I've largely moved on to Skyrim modding and other projects. So Vorians is currently maintaining the project itself, and keeping the forum threads running. 3DAD: I see. So let me start by asking: why was the UL project needed for Oblivion? Arthmoor: The landscape Cyrodiil — the Imperial Province — in Oblivion, while good in its own right, suffered from an awful lot of repetitiveness over quite large areas of the map. So it was broadly decided to start a project to address this and liven up the environment. 3DAD: How are Oblivion PC players, with a full load of UL mods installed, going to experience the game differently? How radical will the change be for them from ‘plain vanilla’ Oblivion? Looking down the Entius Gorge just before dawn, from the entrance chasm. The Entius Gorge Unique Landscape was created by Phitt and was released in 2006.
was put together so I unfortunately don't know the details on what the planning was for that. The results are obvious though — exposing at least some of the dark side of Tamriel we all know exists but don't tend to talk about. The mod’s mood there is definitely one of foreboding, and yet fits in with the series lore very well. I'm honestly not sure if The Dark Forest was ported over from a Morrowind idea or not, but that's certainly possible. 3DAD: So there was no requirement on the UL modders to match the ‘warmth’ of Oblivion for the PC? I mean that the game had a quite emotionally moving landscape already, somewhat like stepping into a fairy tale — and different when compared to the weirdly dreamworld feel of Morrowind, or the generally less colourful and gritty world of Skyrim. Or was the mood of a landscape just down to the aesthetic taste and personality of the maker? Arthmoor: For the most part, no, it wasn't strictly required that any UL mod stick closely to the established mood. In my opinion though, they all did, even if some of them may not seem like it at first. All of the projects members have a deep appreciation for series lore and I think each one of their mods reflects this. 3DAD: Did UL get feedback from Bethesda? or bit-rotting in a Steam library. Blackwood Forest is at the far southern tip of the Imperial Province, below Layawiin. It has a large forest that runs down into a wide region of moist ground filled with small creeks, streams and pools, where the sea is slowly encroaching on the forgotten ruins of an ancient kingdom. Blackwood Forest was published by Roobsi in 2009.
small. So I would not be surprised at all if some of them had. people have downloaded that bundle so far, which shows how popular and well loved the mods are. Have you broadly achieved what you intended, bar a few compatibility tweaks and the three unfinished UL mods? Our ‘bare basics’ guide to installing Elder Scrolls: Oblivion for running mods Have 15Gb of free space on your PC hard-drive. There's far more to installing and running Oblivion with mods, but these steps give you the bare basics of a quick install: 1. Install Oblivion from the DVD, then the 1.2.0416 patch, then the Unofficial Oblivion Patch, and then the QTP3 UOP350 Compatibility Patch. 2. Install your preferred Oblivion Mod Manager, and then tell Windows to always open OMOD mod files with it. This will save you time and effort in installing mods. 3. Install the Unique Landscapes OMOD via the handy single installer OMOD package. 4. Install Qarl’s Texture Pack 3 – Redimized (1.3Gb) and then the patch for it. This pack gives the game highly optimized hi-res textures, similar to the originals. 5. Then install Detailed Terrain (intelligent seam-blending between textures) and the Detailed Terrain: Unique Landscapes pack. 6. Finally install the LowPolyGrass OMOD mod. This gives you faster frame-rates by using slightly reducedpolygon grass models. 7. Activate the installed mods in your Mod Manager. One of the higher river cascades located along the Brena River Ravine, a Unique Landscape made by Chuck21, IAmTheEmperor and Arthmoor. Released in 2009. Top: The Heath: Wetland, a small marshland area of pools and rare marsh-flowers amid low tussocks. The Heath was released by Phitt in 2009. Middle: Beachside fishing village in the Beaches of Cyrodiil: Cliffs of Anvil by Aberneth, released 2008. Bottom: On the icy wastes of the Jerall Glacier, released by GrandDukeAdense in 2011.
currently has three unfinished UL landscape in progress. Are those mods headed for a release at some point, or have those people gone over to modding for Skyrim? Arthmoor: I believe the three outstanding UL projects will eventually see completion. The two UL farm mods are being done by M Hahn, who is currently a very active member of the Oblivion community. The River Strid UL mod will likely take longer, but I'm confident Carel will be able to pull it off. That's one of our longest running projects but each time we get some news from it, it's always excellent. 3DAD: Are there other non-UL Oblivion mods that you consider equal, in “wow! new landscape!” terms, to some of the UL team’s landscapes? Some of what the Nehrim team achieved, for instance? Perhaps the major “Lost Spires” story mod? project is doing in other provinces. Things of this huge scale were not that common for Oblivion, so it appears as though modders have evolved to bigger and better projects right along with the scaling up of the game itself. 3DAD: What’s next for you, creatively? Arthmoor: I am currently doing programming, Quality Assurance, and some level design for the Windows PC game Witanlore: Dreamtime. This is the first game in a series we're doing over at Druid Gameworks using the Unreal 4 Engine. We're looking to bring our own take on RPGs to market soon. Indie game development is something I see as the next big jump for modders in general, now that the tools for making high quality games are reaching price points more people can afford. As far as Skyrim and other games in the Elder Scrolls series, I have projects in the works, but none are far enough along to tease, other than Keld-Nar. Folks who followed my Oblivion villages mods should have an idea of what to expect when that's done. Arthmoor: In terms of uniqueness, the Nehrim total conversion mod is hard to beat. I loved every minute of exploring their world, even though it was all voiced in German. The quality was excellent and pushed the Oblivion game engine to new levels a lot of people honestly didn't think it was capable of. 3DAD: Arthmoor, thanks very much. 3DAD: I’ve been away from Skyrim for 18 months or more now, which I played heavily modded. As far I can remember there were no Unique Landscapes mods for that game, at least at that time. What would you say are now the closest Skyrim mods to UL, the closest in tone and scope to the UL series? Arthmoor: Thank you for the opportunity. Unique Landscapes mod FAQ: http://www.oblivionmodwiki.com/ index.php/Unique_Landscapes http://www.nexusmods.com/ oblivion/mods/19370/ The Elder Scrolls IV: Oblivion can usually be picked up used in PC disc form for around $6 inc. shipping. It has no ‘limited installs’ protection as newer games do, so can be purchased used. Purchase on disc, rather than Steam, is preferable for modding. chats with the UK indie videogame developer Richard Whitelock, about pairing the Unity engine with art aesthetics for his forthcoming landscape game. stylised in its looks. Would you call it an ‘art game’, a ‘meditative game’, or is it more of a prototype for a larger and more elaborate ‘survival’ style game? RW: Actually, something of a combination of those three approaches — with a leaning towards art and atmosphere. The survival aspect isn’t a central focus in the gameplay. For instance, there is no crafting, no combining two things to make a new thing — just the search for basic heat and shelter. I am uncertain just how harsh the demand for this activity should be, to stay alive in the gameworld. 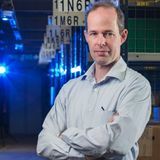 I begin to think that game mechanics — particularly tense, rapid paced or stressful ones — can distract from atmosphere and mood, by way of shifting the player’s attention. 3DAD: That’s certainly so in the start of many games, especially for those who are not hardened games who plough through four games a month. RW: And I want “Into this Wylde Abyss” to be a fairly short, compact experience. So I have to find a balance whereby the mechanics, however simple they end up being, encourage exploration and involvement in the world. is always Grand Theft Auto — I have never finished one, but I have spent many hours simply roaming around. I also loved the locations in Bioshock Infinite and happily played through it on ‘Easy’, just so I would get through the combat faster and back into wandering the locations. The release and subsequent success of Dear Esther, Proteus and others like them convinced me that many people feel the same way I do and I would love to make something for them. That’s what I am attempting with “Into This Wylde Abyss”. 3DAD: For our readers who may be unfamiliar with the current wide range of indie game types, could you say specific trends in current games that have influenced your new game? RW: Minimalism, exploration, a strong sense of atmosphere and the sublime. 3DAD: And there’s a game you’re involved with called “Frozen Cortex”, is any of that being built on by the “Into This Wylde Abyss”project? 3DAD: What other games have inspired you to make this new game? Both in terms of survival games, and also landscape games. For the latter, the major Sony showcase Playstation games which foregrounded the landscape environments — from Eco to Shadow of the Colossus, from Flower and Journey and beyond — spring to mind. RW: I have been collaborating with Mode 7 to create the artwork and style for “Frozen Cortex”. This and an earlier project are very different games to my own projects. It’s great working in concert with Ian Hardingham’s extremely focused design and Paul KilduffTaylor’s world building, writing and music, then finding a meeting point for the art. The engine of choice for Mode 7 is Torque 3D. It’s not a well known engine or as fully featured as Unity, but it finds much favour with coders given that it is fully open source. Paradise Lost. RW: Milton’s text resonates with the ambience of a vast world and the events within it. It’s a powerful and reliable source to dip into for inspiration — which it has been since the earliest versions of “Wylde Abyss”. It may or may not end up referencing it directly, but I don’t see how I could make the game without keeping Paradise Lost readily available for ideas. 3DAD: Let’s talk more specifically about the mechanics of being in the game world. How are you setting about deepening the player immersion in the game world? RW: I am experimenting and iterating on ways in which in which a player can be involved in their landscape and environment, while still having enough remaining ‘attention space’ to enjoy it. There are some real complexities here in attempting to manage player states-of-mind. Almost in the same way the eye of an observer of art or photography is guided or drawn around the canvas, via compositional elements and relative contrasts. In the context of a game world we use the same visual techniques, but we also have to consider motivations, ‘objectives’, gates and paths. I want there to be things to do, but not busywork. 3DAD: Brilliant. So... no “go and get me the skins of six Abominable Snowmen” quests! RW: Well, I want there to be some external pressure, a ‘gravity’ that drives the player onwards but with areas for respite and breathing space. The second real trick is to marry all this with a sense-of-place and story. So if the player finds items, what are the rewards? How does the game world respond to actions performed on those items (to burn or not?). What do they imply or directly convey about the narrative? 3DAD: Yes, the common approach might be “Oh, I found an explorer’s notebook that’s been frozen in the ice for a century”, and then you sit and read for 30 minutes and get the backstory of that place. More interesting would be subtler and more Lovecraftian hints. Passing shadows of a strange shape. Weird audio cues. Uncanny fossils eroding out of a cliff. Which maybe leads me to ask: what does Unity not yet do, that it should, for art games? I’m thinking the lighting/shadows? RW: Well, lighting is a mildly frustrating area. For games which require ‘baked’ lighting only I am confident that the Unity engine is extremely capable, and is really just waiting for a game of significant production value to show that capability at its best. feel that a game has to be more than an environment showpiece which you simply wander around — it needs to change in reaction to the player’s actions and that requires code of some kind. Playmaker and uScript are excellent for visually setting out simple logic, and a recent release called uFrame is incredibly good, if you want to ease the difficult later stages of development when a project has become more complex. Though you have to know quite a bit of C# to make the most of uFrame. 3DAD: Tools and workflows are a big interest for our magazine readers. Could you outline the range of tools and materials/content that you’re using alongside Unity, which don’t operate inside Unity? And then how these integrate into the workflow and process? RW: I have spent most of time in the games industry using software I am sure most are already familiar with. Maya and 3DS Max for 3d work, which was then exported to an internal game engine of some kind. However for the last few years I have been using Blender as my primary 3D software. I had been keeping an eye on it for quite a while, and never felt it was something I would want to use full time. maps and making them into meshes for Vue. Are you using any real-world landscape meshes in the game? Or is it all procedural landscape, auto-generated by the game engine? 3DAD: Ah, so a sort of weird spectral photography, perhaps? Photographs that reveal things that can’t quite be seen or shown in the game engine. RW: Also… should the gratification of seeing the photos be instant or delayed? I have been making photos on film recently and there is something added by anticipating the results... 3DAD: I’ve often thought that sound capture would also be rather cool, to capture a 20 seconds of audio to play back along with the screenshot. I hear that you have something called “Lantern Slides”, that’s a bit like that, or am I wrong? RW: “Lantern Slides” are a technique I have in mind for representing my own conventional photos in a virtual space. I am really keen to make a title which uses this, maybe the “Abyss” in some form. 3DAD: Where and how do you envisage the game being released? I’m thinking it might make an interesting Oculus Rift game? But equally that it could be fabulous on a 24” desktop monitor. RW: I hope to be working mostly on “Into This Wylde Abyss” for the duration of 2015. That should be enough to be able to show more of it publicly. I am developing on PC and Mac. I am also very keen on an Oculus Rift edition, yes. I have a DK2, and have briefly peered into the abyss for testing purposes. The sense of height is incredible and almost quite dizzying at times. There are many areas of concern for developing on virtual reality systems. Will the player motion be too violent for a first person VR game? Is it possible to get the game running at 90 frames per second on common hardware? Well, I’ll certainly be attempting it. 3DAD: This all sounds like a very exciting game. Richard, thanks for taking time out from developing your games, to talk with us. We wish you all the best success with the release of “Abyss”. RW: No problem. Very kind of you to ask! INDEX Background: Triceratops dinosaur from TheHunter: Primal videogame (2014). GET ALL BACK ISSUES for just $35! 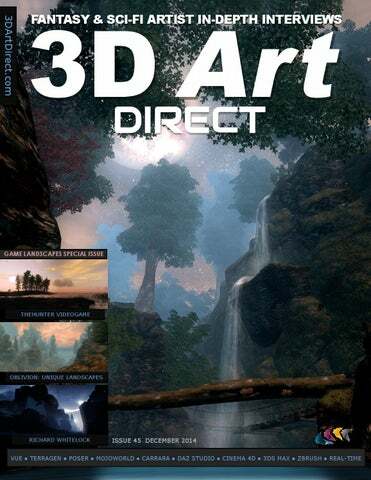 FREEBIES EACH ISSUE 3D Art Direct will boldly seek out new 3d freebies suitable for your creativity. For this issue’s Game Landscapes special issue, we have four free 3d elements to help add features of interest in your own 3d landscape renders. basic ’real world’ test render to show what actually exported and loaded up in the testbed software that we used. Disclaimer: We can’t promise that the Web links on this page will live forever, or that the maker won’t decide to put their freebie on sale in the future. So grab them quick! An unusual shaped medieval gatehouse from BMdesigns, that might add charm to a forest setting. We couldn’t get immediate good results from the Vue .VOB, as you can see above — so you may need to wrestle with it. It is useful in Vue only, as our attempts to export it in various standard 3d formats all met with abject failure. Andrew and Tracey Rolfe (‘Mortem Vetus’) offer this free model for Poser through Runtime DNA. This is a usefully generic model, and could serve as everything from a monkish medieval hideaway in the summer greenwood, to the grim centrepiece of a bleak winter moorland. DIRECT! STONEHENGE AT ITS HEIGHT: This 3d model of the central stone complex at Stonehenge is by Mark Fowler (‘Hypnagogia’). It comes in .OBJ with an excellent single texture, .3DS, .FBX and also as a .MAX file. We did find a few of the top capstones to be little out of alignment in the .OBJ, but it’s easy to nudge them back into their correct position. The mysterious giant stone structure called Stonehenge is one of the key archaeological survivals in the British Isles. Its purpose and makers are unknown, but the structure (as it stands today) was in active use for a thousand years, from about 2600 BC to about 1600 BC. SCI-FI OBSERVATION TOWER: A sleek Observation Tower by UNStudio and AlfreBilbao. A SketchUp .SKP file, we loaded it in the free SketchUp, and exported an .OBJ along with its materials. Cantilevered off a wooded cliff alongside a futuristic home, or soaring alone out above a forest canopy, this tower could add a nice sci-fi flavour to your wooded landscape.